Kid’s Saving the Rainforest (KTSR) is one of our core projects. Based in Costa Rica, they rescue and rehabilitate injured and orphaned wildlife in and around Manuel Antonio National Park. Last year we supported a project which saw the rescue, rehabilitation and release back into the wild of the first troop of endangered squirrel monkeys. The 5 monkeys continue to be monitored by the team to track their progress in the wild, and recently we received news that one of our released squirrel monkeys has had a baby today! This is extremely rare, and the team are currently observing her to see if she keeps the baby. 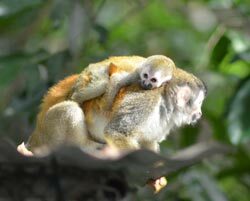 If by any chance she abandons her, they will ensure she is raised in their centre nursery and conduct research to see if released squirrel monkeys can bear healthy babies. ← News from Hope House Haiti!